Remember the days of posting pictures of your dogs, your freshly painted nails, or even the infamous duck-face-selfie on Instagram? Seems like ages ago when that was the typical news feed you'd see, liking as you scrolled on by. But now, users of Instagram use it for far more than that. The current content sells, informs, and educates you. But what stops you in your scroll? Food. Yummy, yummy food. Here, in no particular order, are the 10 Best Food Instagram Accounts that will certainly halt you in your social media tracks and make you immediately follow them. Located in the One World Trade Center, in New York City, is Bon Apetit's Test Kitchen. It is filled with hungry chefs searching and testing new recipes to perfect for you. 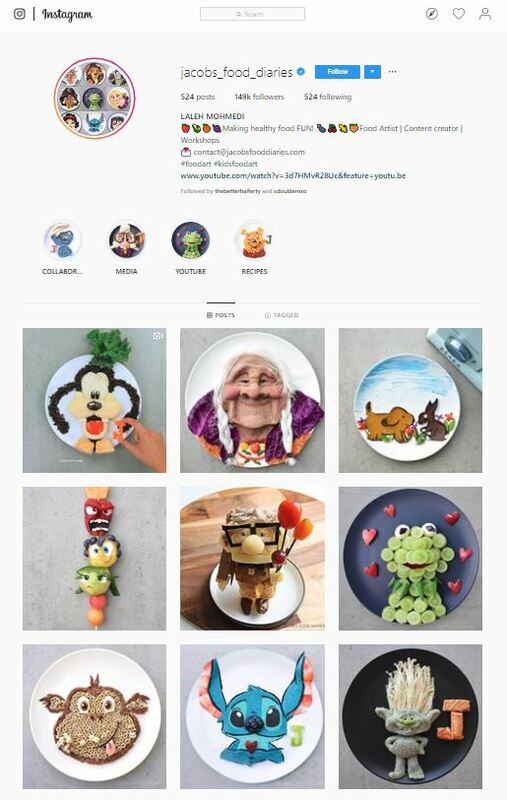 Not only is this Instagram great to follow for it's fresh original recipes shared daily, but for their chefs, that are full of personality. One favorite is Carla Lalli Music, who has just come out with her new cookbook, Where Cooking Begins. She also has a great and entertaining segment on their YouTube channel where she teaches celebrities how to cook, with the twist of them being back to back the whole time. Another favorite chef is Brad Leone. He has the heroic story of test kitchen's dishwasher turned test kitchen chef. He is full of personality, his niche is fermentation and he also has a series called It's Alive! where he shows the step-by-step creation of everything from kombucha to miso paste. 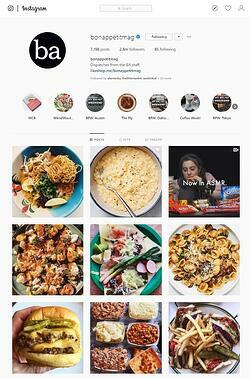 Bon Apetit Magazine's Instagram and recipes without a doubt are for a more advanced cook. Not someone who knows how to make a Beef Wellington like the back of their hand, but more established than those who make ramen every night. "Because healthy should still be delicious." 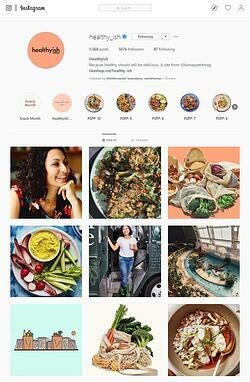 Some of the greatest things about this page is their story highlights that emphasize their Feel Good Food Plan. The #FGFP idea is to make 10 recipes in total for the first two weeks of January. Now, we are way past January, but it's never too late to start and they have each step ready to go for you so you can stay on track with your healthy game! Not only do they inspire healthy but delicious eating habits on this page, but they also push healthy living habits as well. They constantly encourage others to be environmentally friendly and take care of the planet which is growing our food! See the blog on the zero-waste future of grocery stores! Who knew vegan cooking could be this delicious! Lauren Toyota, a vegan, recipe maker, "FoodTuber", and all around ball of fun shows you just how easy it can be to cook vegan recipes. Her Instagram is full of recipes, what she eats at home and on the road, and some PSAs about why she is vegan, and why you should be too! She's not afraid of fried, gooey, saucy food as long as it's cruelty-free! In fact, she is know for her cheese-less nacho cheese. You can find and order her cookbook full of 101 vegan recipes here! Okay, I know you've probably heard about this one, but we cannot say enough good things about their recipes and their feed. Bravo to the production that goes on behind their delicious videos that make it incredibly easy to follow! Seriously, ANYONE can make a Buzzfeed Tasty recipe. If you not only follow them, but also have their app, you are set. From their app you can follow the step-by-step directions, read their cooking guides, and they make a shopping list for you as you add recipes! "Living deliciously, one plate at a time!" Do you just need a little dose of it all? Claire Thomas, owner of grain-free, Sweet Laurel bakery, and creator of the Kitchy Kitchen, brings just that! 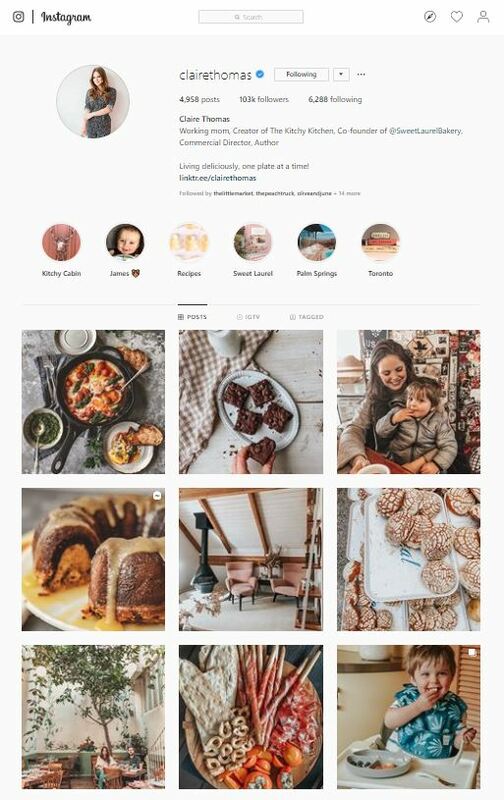 From posts of savory dishes, to baked goods, to pictures of her gorgeous cabin and adorable son, James, she keeps her content fresh and real. You can't find her in "a kitchen" since she is often on the move traveling, but that doesn't stop her from bring delicious treats to you! Remember how I asked if you just needed a little dose of it all? 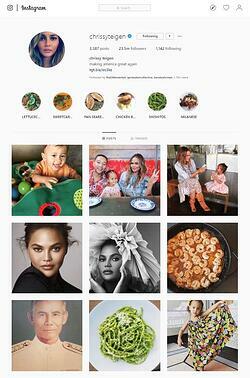 Well, Chrissy Teigen is the queen of realness when it comes to showing her life and her cooking on her page. She has written two cookbooks, Cravings and Hungry for More, and is currently working on her third! What is admirable about her cookbooks are that they are written in true Chrissy Teigan fashion while also honoring her parents dishes, and her recipes she's created herself and with her husband. While you can find her feed often filled with her musician husband, John Legend, and her two gorgeous children Luna and Miles, her Instagram stories have recipes from her two cookbooks and step-by-step directions on how to make them from Chrissy herself. Laleh Mohmedi takes "don't play with your food" to a whole new level. All that can be said looking at this account is, WOW. Laleh was dealt with the problem most parents have, their child won't eat their food. Laleh's son, Jacob, was a picky eater like most children. Thankfully, his mom is a chef and an artist that can create literal masterpieces on his plate, which makes him excited to eat everyday. 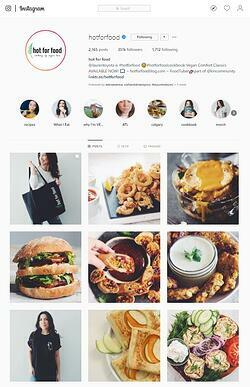 Each post comes with the ingredients she used and it makes it really fun to pick out the different foods at play! This suggestion isn't for inspiration for you to create this in your own home, because who has time for that? It's a page that is just worth that double-tap, and the appreciation it deserves! DREAM JOB ALERT! Melissa Hie, creator of the account @girleatworld, is traveling and eating around the world. 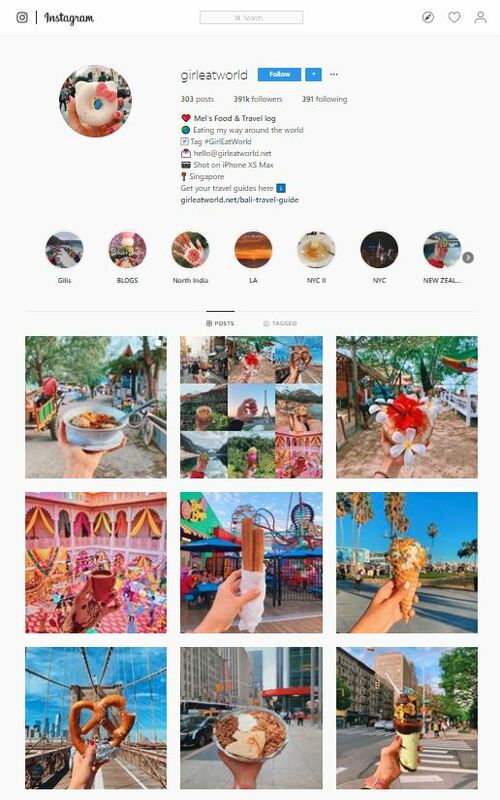 What started as a diary and log for her travels, quickly turned into documenting the delicious and colorful food she was eating in the places she traveled to. Her trademark photo of her dish and the city she is in gives viewers all kinds of cravings for food and travel simultaneously! Come for the food, and stay for the fun. 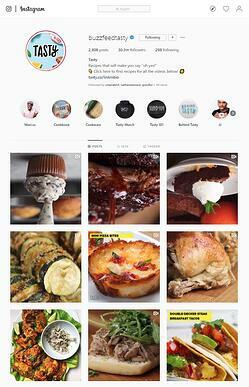 Yummly is basically Pinterest for food. 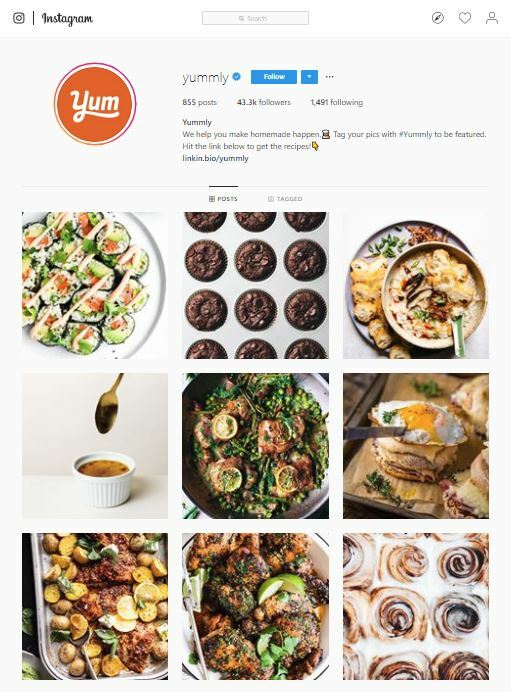 Their Instagram feed is filled with recipes you can create, but it also serves as yummy advertising for their app! 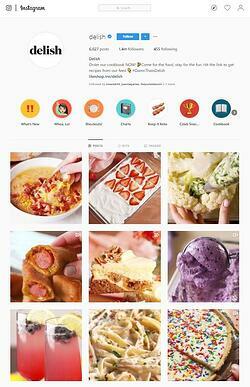 Yummly helps you curate your own personalized digital recipe book. You can update your preferences on diets, allergies, disliked ingredients, and favorite cuisines. From there, Yummly will suggest a plethora of recipes tailored to you! Yummly helps you plan and shop with categorized shopping lists for recipes you've chosen. It also helps you stay on track by getting a notification of when you should start cooking that day to have it ready in time! Buying organic can be costly and is not always the answer.